A couple of years ago husband (then fiancé) and I bought a small cream colored pot with soil and basil seeds in it. It was marketed for the beginnings of an herb garden and it caught my attention. I've always wanted an herb garden in my kitchen window. But, I've never had a window seal big enough. That pretty little pot got stashed away and forgotten about. Until several months ago when husband was tidying up the garage and came across it in one of our packing boxes. Thinking it had no hope of growing basil, we planted it anyway and placed it in our barely-the-right-size widow seal (because that's what you do when you think something has no hope, you hope for it). Low and behold that basil grew and it has taken off. You can see it below, and that photo was taken at the end of April. It has only continued sprouting and reaching for the sun. In fact it's growing so much that we can't use it fast enough. We don't want to waste so we were facing some type of decision about what to do with all the excess. 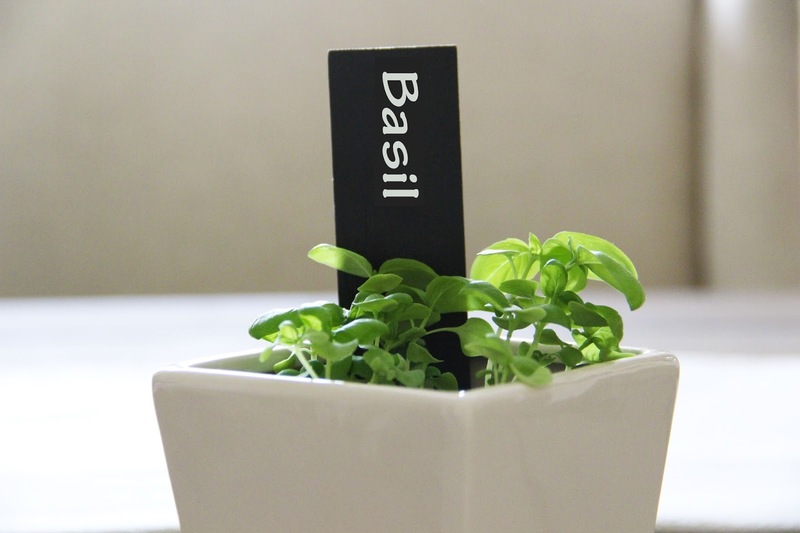 Husband started by gently plucking all the healthy excess basil from the plant. And set it aside. Next he rinsed the chives and chopped them into tiny bits. He made sure to squeeze out all the extra air and that the bag was well sealed. That's really how easy it is to store herbs for a later use. And word has it that basil and chives are two of several herbs that freeze well. 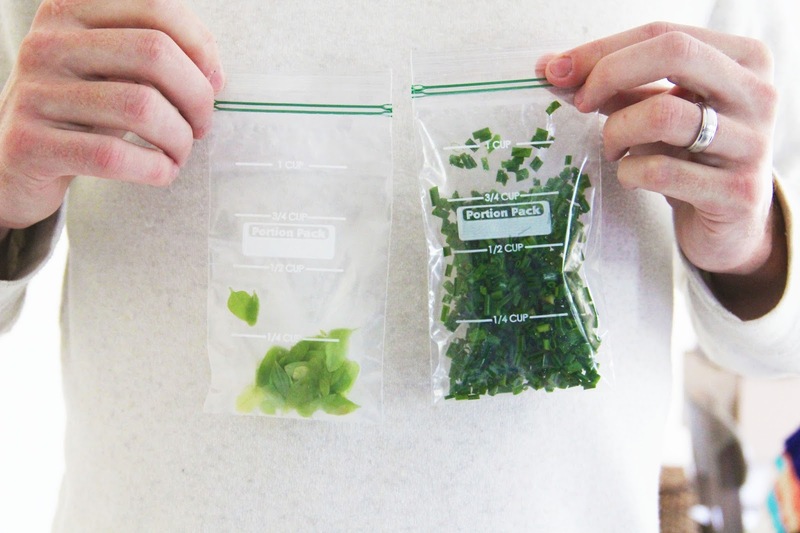 There are multiple methods for freezing herbs such as putting them in ice cube trays with oil or water. It all depends on how you're going to use them in the future. I'm thinking these chives will be making an appearance in some corn cake fritters this Friday! 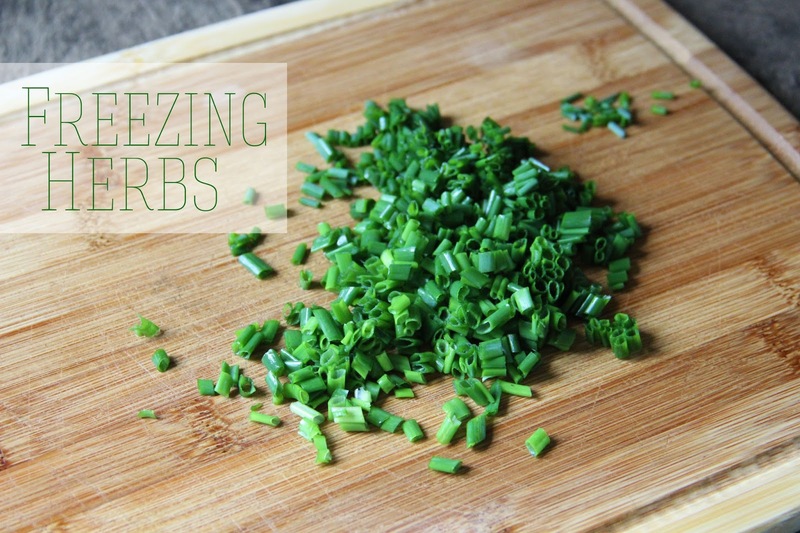 Keep in mind that frozen herbs aren't best for topping food with because they may be limp, but mixing them in with food and seasoning with them is the way to go! Happy Hump Day everyone! And did you see husband's guest post for a weekly August series yesterday?? If you didn't, you should. You won't regret it.